I'm sure you all know who Farhat Hached is... Yeah... I did not think so! Well, I did not know either. I only found out recently after I took a trip to the brand new quarter they built in the 13th arrondissement, next to the Très Grande Bibliothèque. It turns out that he played an active role in the decolonization of Tunisia (the French colonized Tunisia until 1956) and several other things . 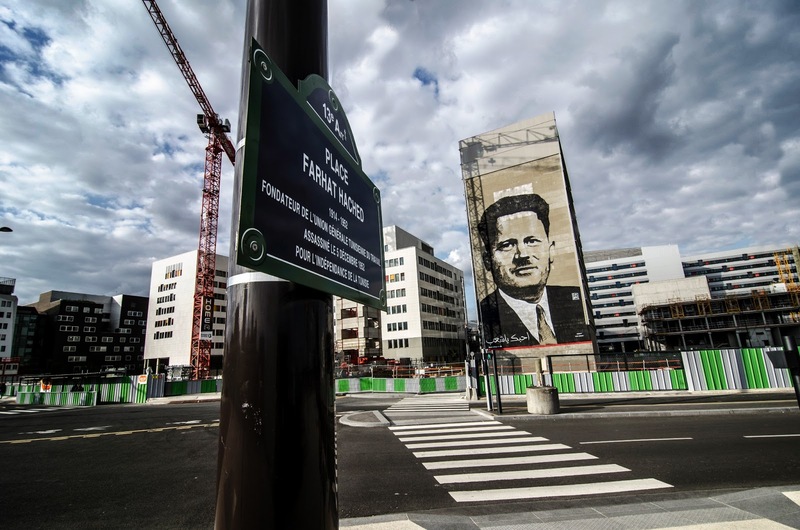 Anyway, the Paris authorities decided to honor him and named a square after him. They also asked Mehdi Bouanani, aka DaBro to paint this giant portrait on the side of a building. Su-perb! Nice photo! And thank you for the history and additional info, as I did not know about Farhat Hached. It's interesting that independence from the colonizing nation is honored by the colonizing nations. Might be time for the "enter the letters" code on PDP comments to keep out the spammers. Sigh. I could try, but a lot of people wrote to me saying that they don't know haw to comment with an acount. So if I turn off the Anonymous function, they will be lost! These past two years I let my blog's comments box run without CAPTCHA, but on "comment moderation" on blogs older than 1 day. Works beautifully, so far. There are spam comments galore in my spam folder, but one click every now and then, and they are history! A couple of days ago I started disallowing "anonymous" comments - that's where the spam in my spam folder comes from. I received immediately notice that this made it difficult for some to leave a comment, so I am back to allow even anonymous comments (mostly friends who don't have blogs). Great composition, and the sky played along too! Thank you for the history lesson. I had no inkling of what it is going to be all about when I clicked on your link! Maybe one thing we'll remember about Eric in the future is that he played an active role in the decolonization of PDP(the blog started in 2005) when it had been overrun by spammers. Anyway, the Paris authorities may decide to honor him and name a square after him. They also might ask an artist to paint a giant portrait on the side of a building. Su-perb! Wow, I didn't know that they allowed anything new in Paris. Just kidding, of course. I find it interesting that a decolonizer is being celebrated. Most countries try to ignore their complicated histories of colonization or play up only the "glorious" part. "What country could I possibly be thinking of?" asks the citizen of the US. LOL/ It's not that easy though. A lot of French people (the oldest) still think France should have never let its colonies go free! !